This is the way I work with RSS feeds. You may do something different. Keep doing that if it works for you. 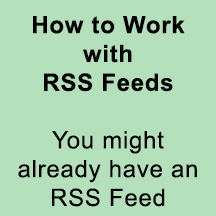 If you are new to RSS feeds, this might help you. I accepted no money or consideration from any company or web site mentioned here. I use RSS feeds on my sites for updates. On the home page of all my web sites, there is a box with all the things I've changed on that site, all in one spot, so people who use my site frequently don't have to search the whole site to discover new content. RSS stands for Really Simple Syndication and it's a way to easily view a stream of information, whether you post in on a web site like I do, or whether you use an RSS reader to catch up on changes at the sites you visit frequently. Open a .txt document in which you can save all your work. Skip the appropriate heading, or read the whole thing. If you use a commercial blogging service, you already have an RSS feed. Search “What is my [service] rss feed” and you’ll find instructions. If you use Blogger (blogspot), it’s http://blogname.blogspot.com/feeds/posts/default?alt=rss where [blogname] is your blog’s name, same as it is to navigate to. Your personal Facebook page, your business Facebook page, and your Twitter feed all have RSS feeds as well. To find your Facebook ones, use this tool to get your ID number. (Put it in your handy .txt file.) The RSS URL for a Facebook page (business or personal) is http://www.facebook.com/feeds/page.php?format=atom10&id=YOURID where [YOURID] is the number you got from the link. If you have more than one page you'll want RSS feeds for, repeat for each one. For Twitter, the RSS URL is: http://api.twitter.com/1/statuses/user_timeline.rss?screen_name=USER Where [USER] is the username. Put all these URLs into your .txt file.